SAGA OF THE RENATA : Thinking about renting your dock? We are in the process of upgrading the website. Please check back frequently. The LIWMD was created as a dependent special district by the Broward County Commission in November, 1970, for the purpose of protecting the water quality of the waterways in Lauderdale Isles. The district became a dependent district within the City of Fort Lauderdale when the city annexed Lauderdale Isles in 2002. The primary duty of the district has been aquatic weed control in our canals. The current board of commissioners of the LIWMD is in the process of expanding the role of the district beyond aquatic weed control. Some of the issues being addressed are: water quality, dock construction, derelict boats, consumption of fish and blue crabs, dilapidated docks, canal depths & obstructions, canal debris, nuisance alligator control, waterway clean-up, safe navigation, and waterway safety. 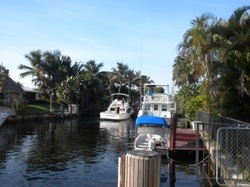 This new web site is being developed as a one-stop source for all matters regarding the waterways of Lauderdale Isles. We welcome any suggestions you may have. Feel free to send them or any questions to us using our "CONTACT US" page on this site.